2018 saw a spate of major cyber attacks including the hacks of British Airways, Facebook and Marriott. Despite growing emphasis on and awareness of cyber threats, large organizations continue experiencing massive data breaches. And as the world becomes increasingly connected (cars and medical devices, among others), attack vectors are evolving and exposures multiply. In 2018, the total amount of funding for Israeli cybersecurity companies across all stages grew 22 percent year-over-year to $1.03B. This closely matched the funding trends of 2016 and 2017 that each saw 23 percent year-over-year growth in funding amount. At the same time, 2018 saw 66 new companies founded, an increase of 10 percent over 2017, which represented a rebound after a dip last year (60 new companies in 2017 vs. 83 in 2016). Notably, average seed round increased to $3.6M in 2018 from $3.3M in 2017. 2018 marked the fifth consecutive year the size of Israeli cyber seed rounds grew. Since 2014, the average seed round size has increased 80 percent. Breaking out data on seed round funding into cyber startups targeting emerging vs. traditional markets reveals an even more pronounced growth trend. 2018’s aggressive early stage funding rounds disproportionately focused on companies pursuing emerging fields within cybersecurity. Of the 33 seed rounds raised in 2018, 20 (61 percent) went to companies in emerging fields. Even more striking, the sum of all seed rounds for emerging tech companies in 2018 was $79M, a 76 percent year-over-year increase. The numbers are clear, there is overwhelming investor interest in emerging cyber tech. While nearly all Israeli founders leverage the skills and know-how acquired in the IDF’s various technological units, the need for experience from the private sector, either as an executive or an employee, seems to be more prevalent. Larger seed checks and larger ambitions are fuelling this push for more mature, veteran founders. Rising founders are not simply looking to build a novel technology and score a lucrative acquihire exit from an existing giant–they want to push into greenfield territory and stake a market-leading claim all their own. Beyond general trends, 2018 also had many exciting individual exits. Checkpoint-Dome9 and CyberArk-Vaultive were notable because both acquirer and acquiree were Israeli — a mark of true market maturity. 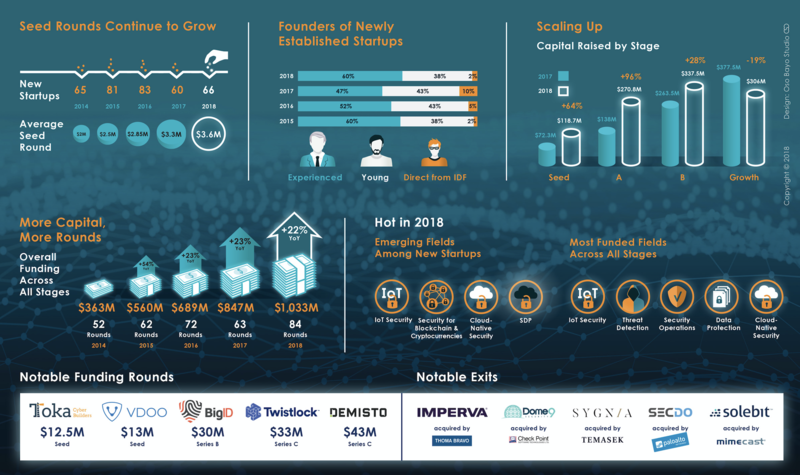 The acquisition of Sygnia by Singaporean holding giant Temasek also was remarkable because it shows that the Israeli cyber market continues to attract new classes and kinds of global strategic players each year. In addition, Thoma Bravo’s $2.1B acquisition of Israeli cyber firm Imperva made waves throughout the industry. The 2018 Israeli cybersecurity market boasted an excellent exit climate, highlighted not only by Imperva’s large-scale acquisition but also by the diversity in the types of players in the space. As such, the local cybersecurity market signals its ability to create and nurture large-scale security vendors, thereby attracting variety of both international and local players which continue identifying and capitalizing opportunities in this domain. For 2018, as has been the case for many years past, the state of the cyber nation is strong–and 2019 appears to promise more of the same.